Rupert Murdoch owned Daily Telegraph continues to push their Pro-Vaccine, Pro-GMO & Pro-Fluoride agenda and is failing miserably. Back in April 2015 the Terrible Telegraph, better known as Rupert Murdoch’s The Daily Telegraph, published an article titled: Galaxy Poll: 86% of Australians want childhood vaccinations to be compulsory. Within the article the Telegraph conducted a poll of its own for its readers to vote fore or against compulsory childhood vaccinations. I wrote an article a day after the Telegraph published its piece highlighting the fact that their very own poll showed the exact opposite of what their article was saying. To put it simply, Telegraph readers did not want compulsory childhood vaccinations. Contradicting their own headline. See here. The poll in their article has since been removed. Along with any evidence that may be contradicting their official narrative. With the exception of my screenshot saved in the link above. The Daily Telegraph is at it again. This time they’re back on the Pro-Fluoride agenda. The Terrible Telegraph wants all of Australia to make water fluoridation mandatory. Their article seeks only to disparage those involved in the anti-water fluoridation community. It makes absolutely zero mention of where their highly touted miracle substance “Fluoride” actually comes from. Nor provides any scientific facts or links to back up its claims. For those readers who may not be aware, here in Queensland the city councils that have opted to fluoridate their water supply primarily source their fluoridation chemicals from China. They are in fact a toxic waste bi-product of the Aluminum production process as well as the phosphate mining industry. If you were to ask most people in public they wouldn’t be aware of that fact nor would they know what the chemical actually is. There appears to be a widely held misconception in the public that the fluoride added to our water supply is a purified, quality controlled, pharmaceutical grade product. This couldn’t be further from the truth. The product used is usually Sodium hexafluorosilicate among other similar toxic concoctions. Basically if the exact substance used to fluoridate our water was dumped in a creek it would be labelled environmental vandalism. If it were dumped into a river…environmental vandalism. A lake… Same again. Yet this toxic waste is added to municipal water supplies throughout the country and is then all of a sudden 100% safe and effective. Where have we heard that before? I digress… The Daily Telegraph article has once again placed a poll within their article to gauge readers responses to their agenda. As you can see from this screenshot (Below) their poll has yet again backfired! People are waking up to their massive propaganda push. 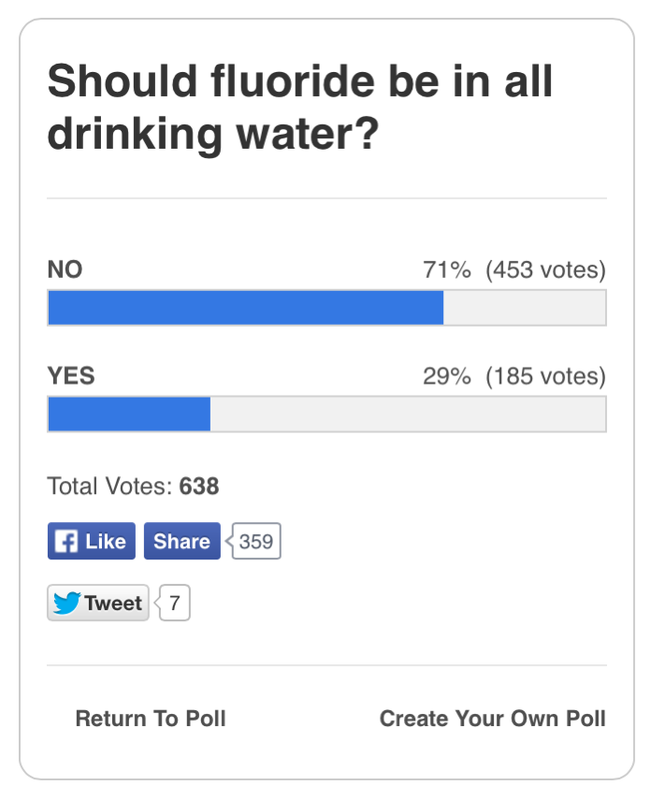 More than 2/3 of the votes are against adding fluoride to all drinking water. The Daily Telegraph has yet again been embarrassed by their readers. Murdoch believes his readers are dumb enough to fall for their lies and spin. Clearly people are waking up faster than they can churn out the propaganda. I cannot believe ‘they’ still are trying to poison us. It is over thirty years now and still the same old propaganda is rolled out. Harvard studies show the link to Austism and as you so rightly say, it is not a natural product that is being dispensed as mass medication, but slurry, crap; a bi-product from the aluminium industry. Heaven knows how much heavy metal comes with it. I agree. It simply does my head in. Further, either the perpetrators have money interests, are blindly stupid, are ideologues who care nothing about true health or are schemers of the wickedest order; or a combination of all 4 options. Wake up people up, please, to the evils that are besetting us. Again… I completely agree. I often wonder what their motives are for trying to harm us. The real reason they put fluoride in water is to calcify the pineal gland and keep us dumbed down. The pineal gland is our spiritual and creative centre in the brain and we are a lot easier to control with it turned off. Kudos to you for taking the time to fight these rapscallions. Don’t you get the feeling that everyone is so docile from drinking Fluoride all of their lives, that when these topics come up, they cannot comprehend the seriousness and tend to just follow the same old rhetoric that comes from the controlled media outlets….? Fluoride was initially introduced into WW2 concentration camps to achieve the same result – make people ‘docile’. Yes people are waking up – though very slowly – thanks to sites such as this. But it will need A LOT more action from a lot more people if we’re ever going to get the required changes. ‘Lock the Gate’ have been one of the more successful grassroots campaign groups. Perhaps we can learn something from them. Poisons Schedule: S7 Dangerous Poison. accordance with the provisions of this Act. Why would this need to be in the act?